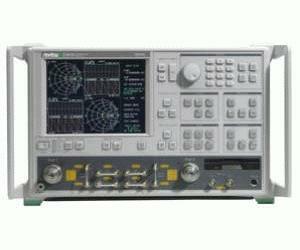 The Lightning family of microwave and millimeter-wave vector network analyzers encompasses a wide range of high performance, component test tools designed to address the growing needs of defense, satellite, radar, broadband communication, and optoelectronic component markets. The Lightning family features the latest in technology and performance. Specific models and added options offer higher levels of measurement capability, including Time Domain, Gain Compression, Harmonic, IMD, Frequency Translation, Multiport, and E/O and O/E measurements, in addition to fast and accurate S-parameter measurements. Complete measurement solutions to 20, 40, and 67 GHz are available in microwave models 37x47, 37x69, and 37x97, respectively. For applications above 67 GHz, the ME7808C Broadband VNA is the perfect solution. The award winning ME7808C VNA covers fast single sweeps from 40 MHz to 110 GHz. The broad frequency coverage makes the ME7808C well suited for on-wafer test and device modeling applications. In addition, the ME7808C is configurable as a millimeter wave system for applications requiring banded coverage in waveguide. The millimeter wave system is an economical alternative to the Broadband VNA and can be configured to cover the V, E, or W bands. Extended E and extended W bands are also offered to meet the needs of new Wireless LAN and Automotive Collision Avoidance applications.